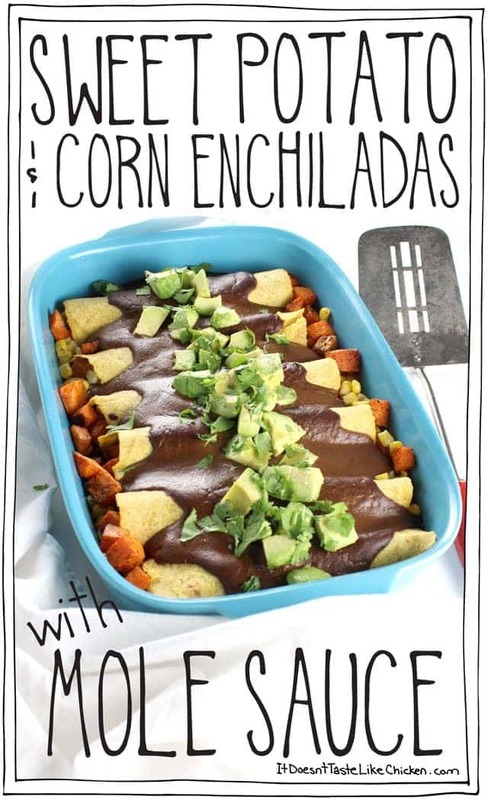 *I’ve since learned that corn enchiladas with mole sauce are acutally called enmoladas. Whoops! So maybe you were impressed when I made chocolate savoury with my recipe for Easy (Cheater) Vegan Mole Sauce… I was impressed. I mean, chocolate for dinner!? Yes! So what if I told you, that I used that spice packed savoury chocolate sauce, and poured it all over some enchiladas. 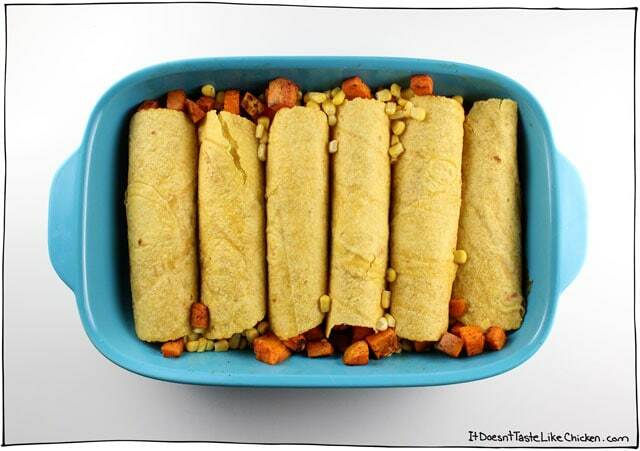 I mean, not just any enchiladas, these are sweet potato and corn enchiladas. 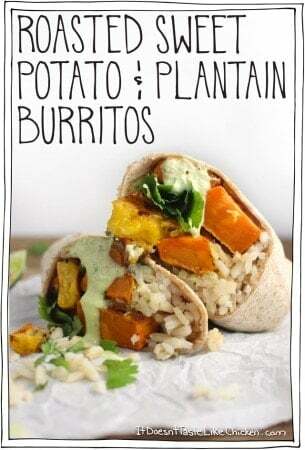 Soft, warm, chili roasted sweet potatoes with pops of corn sweetness, all wrapped up in a fluffy tortilla. Yeah, I totally did that. But don’t think I stopped there, because I found a way to a vegans heart, and that way is called “avocado”. Uh huh, you know it. So I’ve got these sweet potato & corn enchiladas, then I smother them with mole sauce, and I top that with the way to a vegans heart. Mic drop. 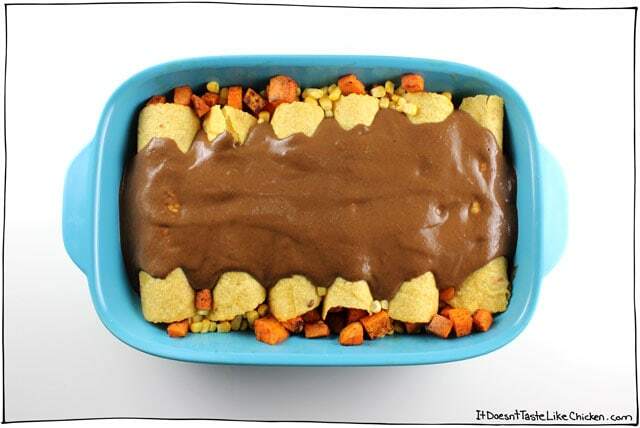 To make Sweet Potato & Corn Enchiladas with Mole Sauce: Spread the sweet potatoes across a large baking sheet, then drizzle the olive oil, chili powder, and salt across the potatoes. Toss well to coat the sweet potatoes. Bake for 12 to 18 minutes, turning every now and then until the potatoes have browned a bit on the outside and are tender all the way through when pierced with a fork. Don’t eat them all! Don’t do it! While those are baking you can whip up the mole sauce if you haven’t done so already. 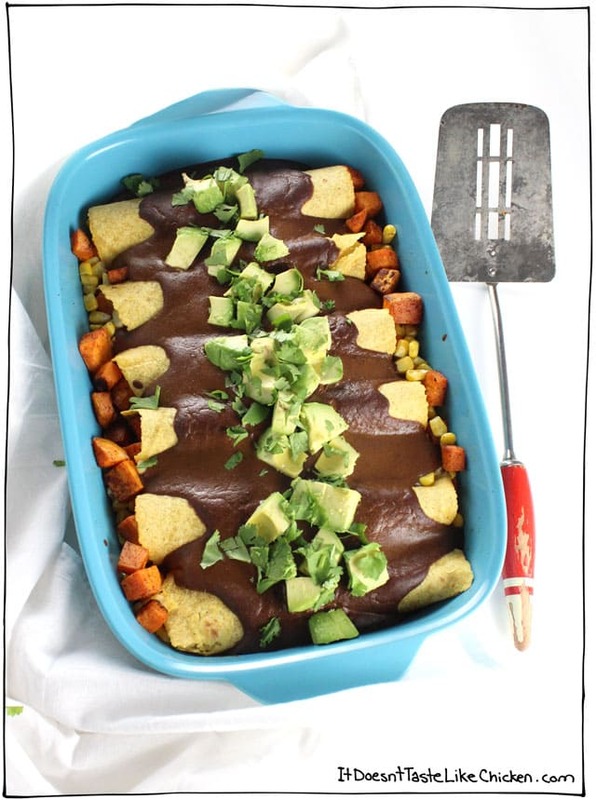 Spread ⅓ of the mole sauce to cover the bottom of your baking dish. Assemble your enchiladas by filling a tortilla with ⅙ of the sweet potato and ⅙ of the corn (don’t worry about trying to make this perfect). Roll it up, and place it in the baking dish, with the seam side down. Repeat with the remaining tortillas until you have filled your dish. If you have any leftover sweet potato or corn, just shove it down the sides. Spread the remaining mole sauce across the top of the enchiladas. Bake for 15 to 20 mins until hot all the way through. Garnish with the avocado and cilantro before serving. Omnomnom! So flavour-packed they will satisfy everyone! Pretty quick and easy to make too. 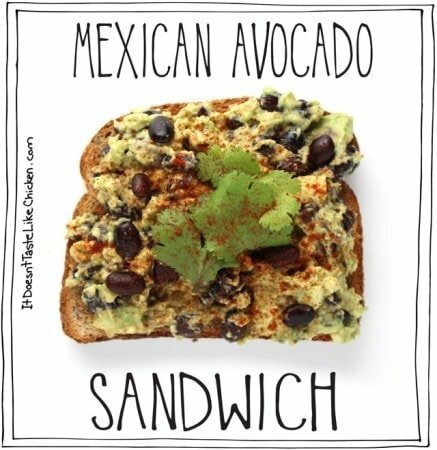 Topped with avocado makes a perfect Mexican inspired weeknight meal. 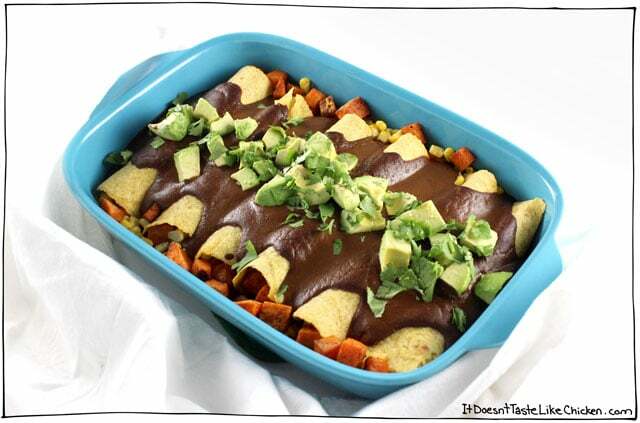 *I've since learned that corn enchiladas with mole sauce are acutally called enmoladas. Whoops! Preheat your oven to 450F (230C). 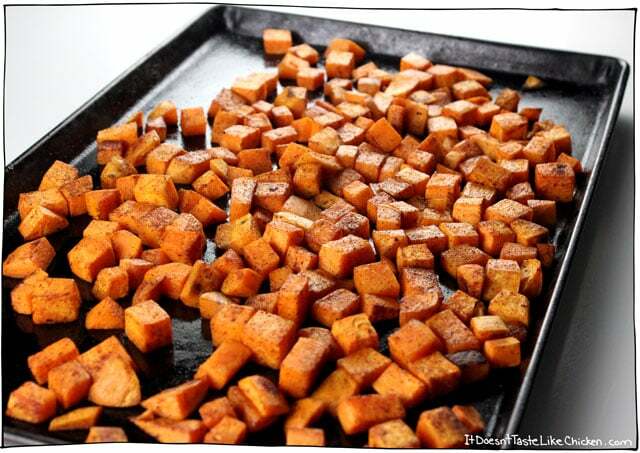 Spread the sweet potatoes across a large baking sheet, then drizzle the olive oil, chili powder, and salt across the potatoes. Toss well to coat the sweet potatoes. Bake for 12 to 18 minutes, turning every now and then until the potatoes have browned a bit on the outside and are tender all the way through when pierced with a fork. Remove from the oven and set aside. Reduce the over to 350F (180C). Spread 1/3 of the mole sauce to cover the bottom of an 8" x 11" baking dish. 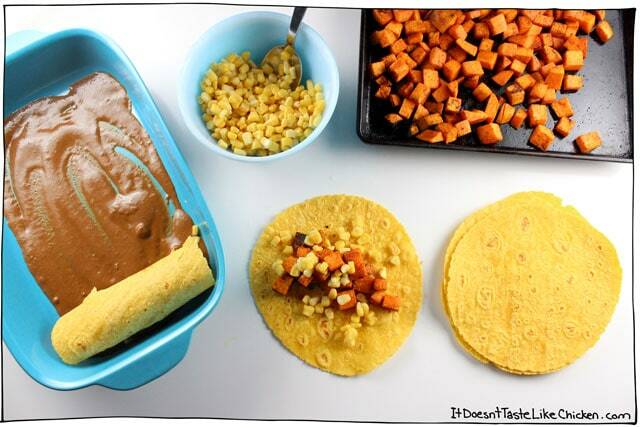 Assemble your enchiladas by filling a tortilla with 1/6 of the sweet potato and 1/6 of the corn (don't worry about trying to make this perfect). Roll it up, and place it in the baking dish, with the seam side down. Repeat with the remaining tortillas until you have filled your dish. If you have any leftover sweet potato or corn, just shove it down the sides. Spread the remaining mole sauce across the top of the enchiladas. Bake for 15 to 20 mins until hot all the way through. Garnish with the avocado and cilantro before serving. Loved this very much. Just the right amount of spice. I had to really rein myself in from eating the whole darn batch in one evening! Have you tried putting extras in the tortillas? I have some pepper, courgette and kidney beans too, worth throwing in? I haven’t but I think that would be delicious! I have a little extra mole sauce leftover. I saw your suggestions for using it on grilled tofu, veggies, or burritos/tacos/rice and beans. What is your favorite way to use it (besides these “enmoladas”)? It really makes me happy find recipes which involve ingredients like “mole”. I have to admit it, I’d never been a huge fan of mole (yeah, it’s a kind of sin being mexican and not eating it), BUT, a year ago I had the fortune to eat “tlayudas oaxaqueñas” (these are like… BIG tortillas with ingredients on top: mole, avocado, cheese, beans) and they were delicious! Now, I’m looking forward to try your recipe. 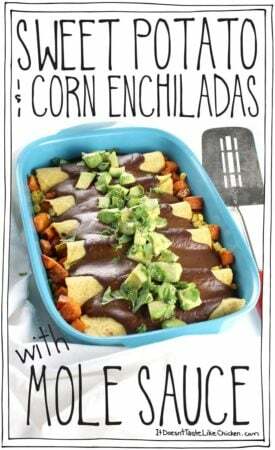 By the way, the correct name for your recipe is “enmoladas” (Corn Enchiladas with Mole Sauce = enmoladas) and not “enchiladas”. I don’t want to be disrespectful, just thought you may want to know. 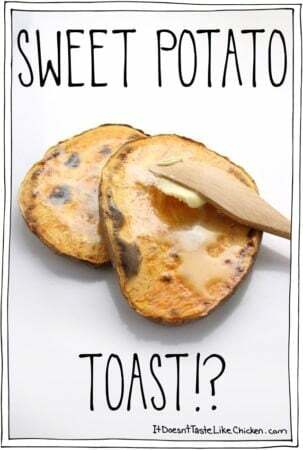 In our country isn’t common to eat sweet potato inside of the enchiladas (actually, it’s a really good idea), instead we use potatoe and carrot or cheese. However, your recipe looks fantastic! I promise I’m trying it this week. Also, I want to ask you: Do you have any idea of how to cook vegan Rice Krispies Treats? It’s been YEARS since the last time I ate one and I’m dying, jaja. I tried to make vegan marshmallows and guess what? THEY WERE A DISASTER! Enmoladas, whoops! Thank you so much for letting me know, Samantha (great name by the way 😉 ) I’ll make a note on the recipe. I absolutely do have an easy marshmallow-free recipe for rice krispie treats! 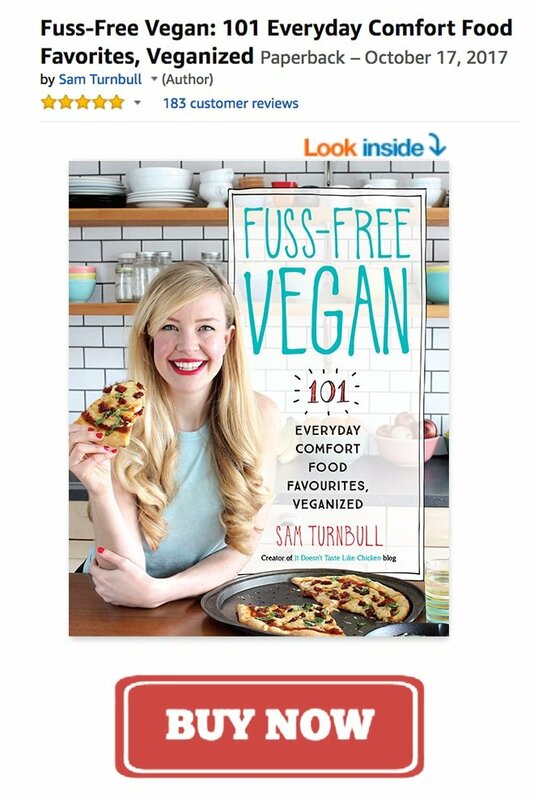 It’s in my new cookbook, and the presale of the book begins in 6 days! Make sure you are subscribed so you don’t miss a thing (there is a free gift involved). I really hope you enjoy the enmoladas when you get to testing it out. I was so excited to make this. I printed out both recipes, put them in clear plastic protector sheets, and headed out to grocery store. 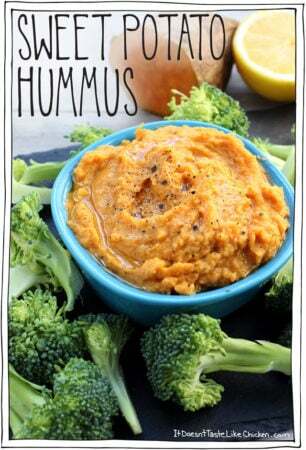 Had my sauce – yummy – roasted my sweet potatoes and realized I forgot tortillas!!!!! I was not a happy camper. Guess what? Tastes great as a tofu scramble. I will try again next week!